“Rig” is a funny word. We use it in many ways. Perhaps the most common use is when someone says they are “working on the rigs”. This would indicate that they are working on a windy platform out in the North Sea. But, apart from the historical sailing terms, there are other uses of “rig”. For instance, according to the Urban Dictionary it is Australian slang that “defines a well fit chick/bloke. They contain a hot body and a face that does not need plastic surgery“. For the dedicated Bongonaut, “rig” also refers to the full unit when towing a largish load behind your vehicle, as shown above. Unusually, Stef Young’s use of “Rig” can apply to at least 2, and possibly 3 of the descriptions above. This is his tale. “I’m a 39 year old guy who works as a climber on the oil rigs and work around 4 months out of the year. The time I spend at home is filled with all sorts of things to keep me busy; fishing, tennis, gym, pubs etc, but I knew I needed to get out and see the country more and maybe take my fishing boat with me. I needed something that could tow the boat with and allow me to stop, eat, sleep and relax as and when I wanted, wake in the morning and drop my boat in the water, go fishing and have total freedom!!!! THE SEARCH BEGAN. I spent nearly 12 months looking at different options for my ‘missing link’; motorhomes, VW transporters, and Bongos. 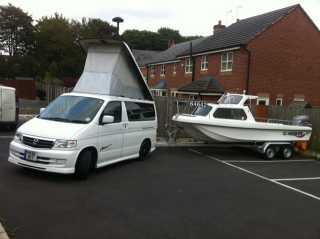 I realised that after all my research the one that (to me) comes out on top is the Mazda Bongo. The reason for this is pound for pound the Bongo is the most cost effective option and gave me everything I was looking for in a freedom van, all I needed to do now is find one!!!! After looking at different styles and models I decided that the one for me was the Aero city runner in white. I kept my eye on a few sites and eventually found the one I wanted from a guy selling private in Bristol, I was in Denmark working at the time and did not want to miss this one as It was THE perfect model for me!!………….. YES! I won it……………! !